Mother-of-Thyme will soon be sprouting on the roof of Greg Spatz's backyard writing studio. This is by design. His wife Caridwen Irvine-Spatz's design. The studio, which is now under construction, was Irvine-Spatz's brainchild. She wanted to give Spatz a place away from the household hustle-bustle (two energetic young boys, ringing telephones, honey-do's) where he could concentrate on his fiction writing. Irvine-Spatz, who teaches fiddle at Holy Names Music Center, also saw the studio construction as an opportunity to pursue another passion - sustainable architecture. "There's a logic and justice and need for sustainable architecture," she says. Further, this type of structure met her family's requirements for the project. First, the structure had to be inexpensive. Second, it needed to be less than 200 square feet to meet code. Finally, it had to be sound-insulated so Spatz, whose third novel has just been accepted, would not be distracted when working there. Using the Internet, Irvine-Spatz researched options, including one invented by Cal-Earth and used for shelters in developing countries. Then in collaboration with environmental designer Don Stephens, they chose a hybrid technique of Stephen's invention. 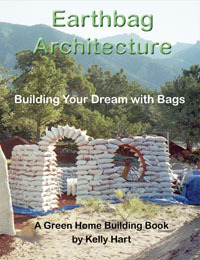 Instead of using earth-filled bags, the basic building blocks ended up being bags filled with rice hulls. Rice hulls are a problem agricultural byproduct. They have a high silicate content designed by nature to make them perfect shields for the rice kernels they protect. Consequently, they do not readily decompose. They are, however, insect- and fire-resistant and make good insulation. Stephens procured from California enough hulls for the entire structure at a cost of only $300, including shipping. A roll of woven polypropylene material from which to fashion tube-like bags was purchased from Justus Bag Company in the Spokane Valley. Irvine-Spatz began construction by digging a 3-foot trench to define the studio's perimeter. 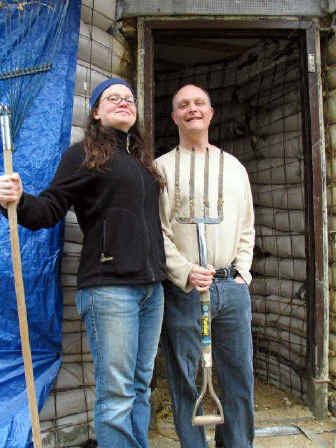 Remesh, a heavy wire grid, was set along both walls of the trench and rubble shoveled in. After an initial three tiers of earth-filled bags were laid down, hull-filled bags were stacked, tier after tier, with recycled barbed wire between them to act as "mortar." As the wall rose, sections of remesh were added and cross-tied with wire to secure the interior and exterior remesh together. To provide ambient light, Irvine-Spatz used wine bottles (donated by Mizuna restaurant) and Mason jars. She placed bottle-and-jar pairs, mouth-to-mouth, and sheathed them in used aluminum printing plates (donated by Garland Printing) to create "light tubes." These she tucked between tiers. The studio's roof is supported by a central, hollow, rectangular steel beam purchased from Pacific Steel & Recycling for $40. The beam rests on a tree trunk Stephens salvaged from a clear-cut in Oregon and which Irvine-Spatz debarked using a kitchen pie dough scraper. Radiating from the central beam are wooden 16-inch I-beams. "You could park a Volkswagen up there," Irvine-Spatz says, about how sturdy the roof is. The roof itself resembles a layer cake in its construction. First come two layers of plywood with tarpaper in between. That's topped with Mel-Rol, a super-thick asphaltic membrane backed with a sticky emulsion. According to Stephens, Mel-Rol was designed primarily for large industrial buildings with rooftop gardens. The Mel-Rol is covered by an old piece of second-hand carpet to help hold a layer of topsoil in which has been planted mother -of-thyme and sedum, too. Both plants are highly drought resistant, requiring little moisture to thrive. Inside and out, the studio walls will be covered with stucco. The studio floor will be clay sealed with beeswax and linseed oil. Finally, an old Chinese teak door, purchased from Main Street Antiques, will be hung. And then the studio will be ready for the writing in solitude to begin. "As a mom and a musician, I find as a soon as you do something, it's over," Irvine-Spatz says. "You cook and the food is eaten. Gone. You wash the dishes and 10 minutes later the sink is full again. You do a performance and pretty quickly it's over. That's all good and important work, of course, but I have a need to do stuff that stays here, too - like Greg's studio."